Daisy Christodolou said something very important in one of the Michaela debates about education. She said that the debate between traditionalists and progressives was not “teacher-directed” vs “student-directed” but rather that traditional teachers were “knowledge-directed”. The learning in a classroom should be directed by the best that has been thought and said, not by the whim of teachers or students. The reason this is important is because progressives like to portray traditionalists as trying to control the learning in their classroom with students being passive recipients of what they say rather than critically thinking about what is said. Knowledge-directed is something else, you can critically think about the best that has been thought and said – people have been doing this since at least the time of Socrates. 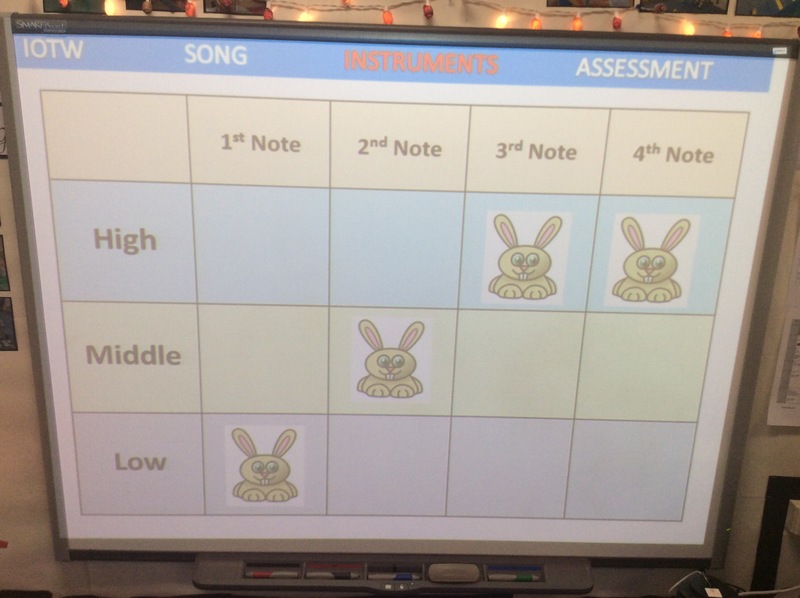 I have shared the aims of what I am trying to achieve in the music classroom and these are based on powerful knowledge. With this knowledge, students are freed up to independently learn, become creative and critically think. For example, being able to read notation means that the single biggest barrier to learning an instrument has been taken away. Notation is a transferable skill, if you can read clarinet music, you can also read violin music. Understanding the chronology of Western Art Music will help you understand why composers wrote what they did and what they were building on or rebelling against. It is impossible to understand early 20th Century music without a good grounding in Romanticism, especially Wagner for this reason. And of course, composition is much, much easier when you understand basic harmony. The idea of composing with little knowledge of harmony is a big mistake. Sadly, the main delivery method of composition in the KS2/KS3 classroom is without any prior knowledge of harmony. And that is why in most cases, it is a complete waste of time. The best way to decide what knowledge you want to teach is to think what the children ought to be able to do and know by age x. If you are really unsure, the Core Knowledge Curriculum by Civitas is a good start and has a pretty good list of music for music teachers to teach. At the end of the year I will release my curriculum which has detailed lists of repertoire to sing and play for each year group. Before you start to think about your repertoire you need to think about your aims. My aims for Key Stage 1 are relatively straightforward. This is easier than most teachers think. There are very few children who cannot sing in tune. The reason you get the “growlers” and the “mumbles” is due to poor initial technique. This is where the Kodaly method comes into play. Start off with lots of singing games in the so-me and la range and this will help the children to sing in tune with one another. I use “Little Sally Saucer” primarily to achieve this aim but there are many other songs that achieve this. From then on I go straight into full tonic sol-fa starting from “do” to “ti”. Some teachers disagree with this and choose songs that use the pentatonic scale first but I don’t as I prefer a fixed “do” system in my teaching for many other reasons that I will go into in a later post. After fourteen years of teaching, I am only recently starting to understand the importance of children distinguishing between their head and chest voice. Chest voice needs little explanation but head voice needs to be explicitly taught. The way to do this is to sing “oohs” at ranges above top C. Then progress to sirens swooping from high to low and back again. Children find this fun. I always knew this and did this in lessons but the one thing I did not know is how top cathedral choirs get that fantastic sound from the trebles. I have learned that they choose songs that start high, or alternatively transpose everything up as high as they can. Then little by little, they slowly bring the range down to try to get the children to sing as much as possible in head voice. I have done this recently by using the songs “Bibbity Bobbity Boo” which starts high and only goes lower in the second line, and “Castle on a Cloud” where I have transposed the whole song up five semitones. Most songs start low and then get higher so if head voice is your aim you need to think the other way around and choose repertoire where notes start high. Sight-singing is a neglected art. I have started to develop this by putting the Kodaly hand signs on the board in a selection of songs that I call “The Mystery Tune”. The children sing the mystery tune in tonic sol-fa and then have to guess what it is. They really like doing this. I pick well known songs they have sung before, like “The Bear Went Over The Mountain”, “Old Mac Donald”, “London Bridge” and “Twinkle, Twinkle”. In Year 3, I start to gradually bring in the traditional staff notation. Sight-singing in the UK is pretty dreadful, if you compare it to places like Hungary, you can see that high standards can be achieved. In my experience, Year 2 children should be able to sight-sing a tune with a piano or guitar accompaniment. In later years I would expect it to be done unaccompanied. As I have written in a previous post, singing games work and are the best ways of increasing enjoyment, participation and singing in tune. 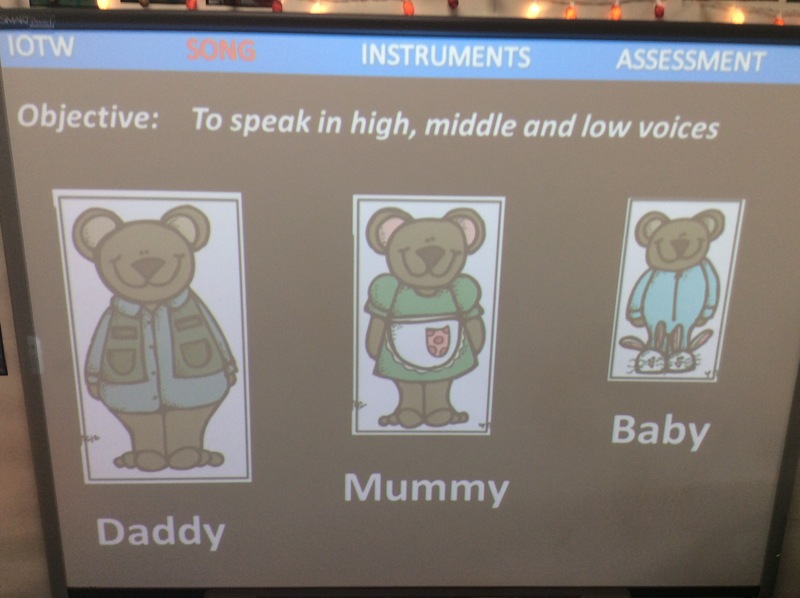 A substantial part of my repertoire for Early Years and Key Stage 1 is based around singing games and this is reflected in the repertoire. An embarrassing consequence of my enthusiasm for singing games resulted in this aim. Basically, we had done so many singing games that when we were asked to perform a song in public, I couldn’t think of anything to do. It would be a bit weird to just play a game in front of the audience and I am sure they would enjoy seeing their children having so much fun but there are conventions that we need to observe and it is important for children of all ages to learn how to perform in front of an audience. So now I teach songs that stand alone for public performance. Most of these do have actions but some are just a straight song where the children stand tall and sing their hearts out to their loved ones in the audience. I tell the children that they get lots of good things from their parents like nice food, being looked after when they are sick, play dates, toys and trips to the park and this is our way of saying “Thank you” to them. Parents want children to sing to them and that is the best present ever. They want to see smiles and a strong performance. Finding the right songs can be tricky – our performance songs this year include “Tomorrow” from Annie, “Never Smile at a Crocodile” from Peter Pan, “Colours of the Wind” from Pocahontas, “Somewhere Over the Rainbow” from The Wizard of Oz and the songs “You raise me up” and the Carol King song “You’ve got a friend”. “Colours of the Wind” is the most challenging. I have put it into our repertoire for this year but on reflection I think I am going to keep this for Year 3 and 4, as technically it is quite tricky and there are a lot of words to learn. This is probably the most controversial of my aims. Many music teachers do not think this is important. I do because we had a guest musician some years ago who asked the children to sing a simple nursery rhyme and the children did not know it. I thought their parents would have taught it to them or they would have learned it in nursery but I learned this was no longer the case. The power of pop and YouTube has resulted in songs that we knew from a young age now becoming obsolete. This includes folk songs. This is a shame because it does mean we lose part of our identity as a nation and also means we have no common reference between generations. Consequently I teach songs such as “When a knight won his Spurs”, “The Skye Boat Song”, “Greensleeves” and folk songs from other nations such as “Waltzing Matilda” and “Cockles and Mussels”. Nursery rhymes are important but can easily be learned by simply putting on nursery rhyme CDs at playtime or by singing throughout the school day. I think we should use these opportunities to make sure “The Grand Old Duke of York” and “I had a little nut tree” don’t fade away with subsequent generations. This all informs the repertoire I choose. I have a list of songs we learn and I divide it up into six blocks to go with the school year. This is a little more complicated than it sounds as I try to make them fit into themes. 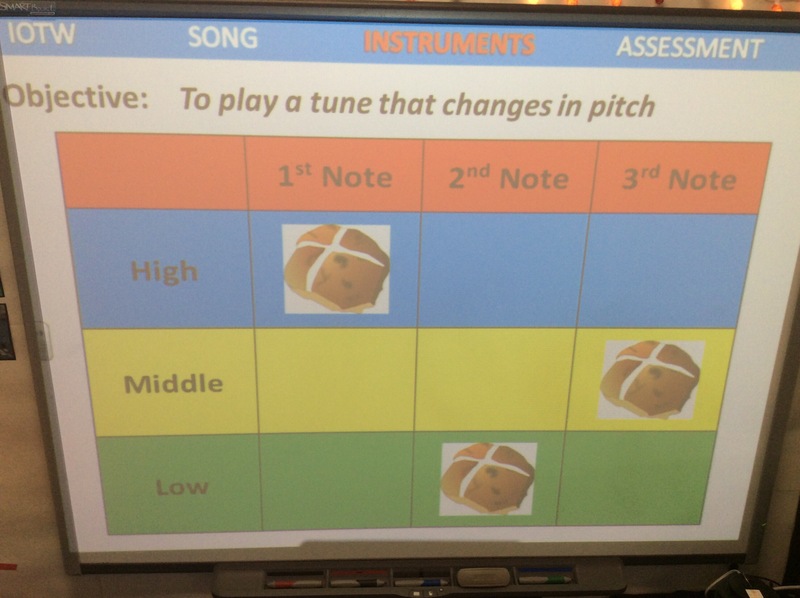 For example, Year 1 are currently learning about pitch so I am putting songs like “Hot Cross Buns”, “The Grand Old Duke of York, “Happy Sun High” and “Somewhere Over the Rainbow” into this half terms repertoire as they all, in different ways, explore pitch and the concepts of high and low. I think it is also very important to repeat songs, there is almost no value in learning a song only once which will be forgotten quickly. All songs should be sung at least twice. And, as with most learning, we need to revisit songs so that the brain has a chance to forget them and then relearn them. This “spacing effect” solidifies learning. Failure to space learning can result in the “Why they can’t do this? I know I’ve taught them this!” phenomenum. It’s not necessarily bad teaching, it’s just that the children have forgotten the material as there was no spaced practice. This incidentally, is one of the reasons why the government is getting rid of modular examinations – students were learning a terms worth of work, cramming for the exams and then promptly forgetting it all. Without modules you actually have to retain information over a longer period of time. The end result is that I have a repertoire of well over one hundred and twenty songs and the expectation is that all children will remember them and sing them from memory by the age of 7. 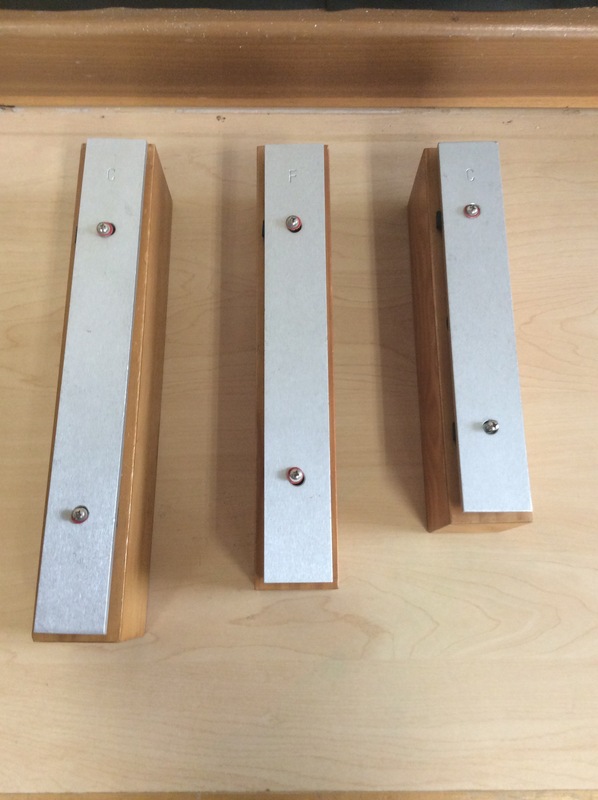 When teaching early years, I often use three chimes when we talk about high, middle and low pitched notes. I also get them to growl like the three bears. This is with EY1 (3/4 year olds). For EY2 we use Hot Cross Buns. 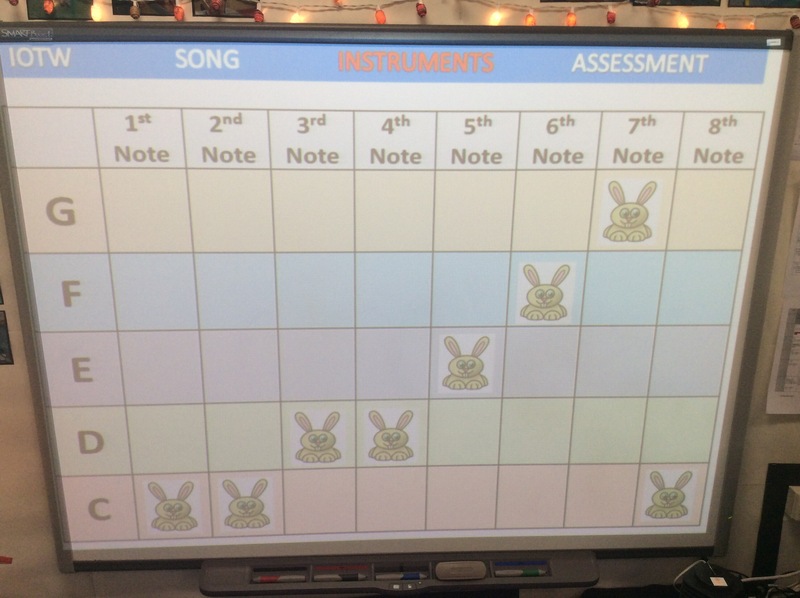 For Year 1 we use Rabbits to go with the Magic Rabbit Scheme. And turns to staff notation in Year 2. 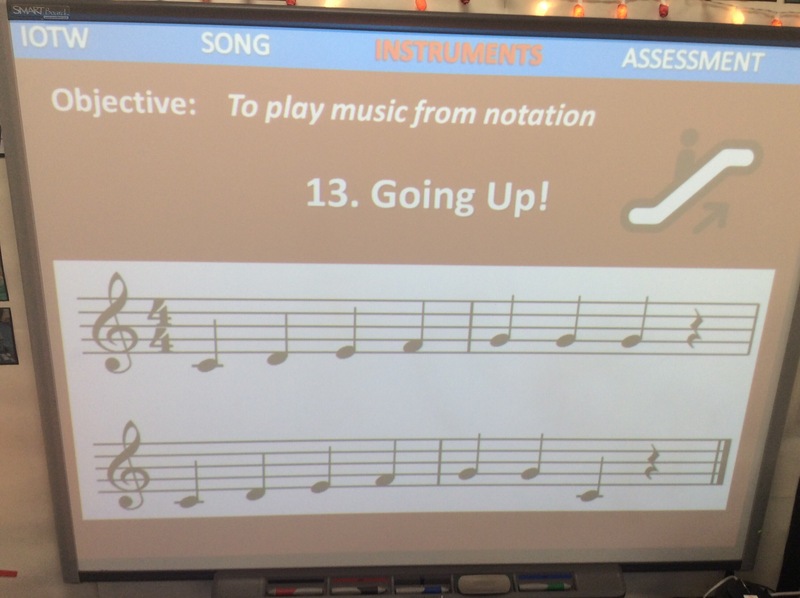 By the end of Year 2, all children should be able to play a five note tune using standard staff notation.